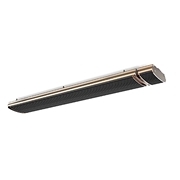 eRAD Heaters utilize invisible “Far-Infrared” wavelengths and are designed to heat areas that typical heating solutions would find difficult to heat. Infrared heaters are ideal for balconies, terraces, patios, gazebos, restaurants, bars, sun rooms, warehouses, and many other settings- inside or outdoors! ERAD Far Infrared Heaters provide a long term, cost effective solution to your heating needs. Infared heat is essentially the most efficient form of heat energy transfer because infrared heating works by heating people and objects within a space (heats evenly and more efficiently). Traditional heating systems (convection heating) work by heating the "air." Infrared heating permeates (passes through) air molecules, resulting in a more efficient and ultimately cheaper method to heat both indoors and outdoors. This means the wind cannot "blow" heat away. Air movement of any kind has no effect on the heated area.